Mattias Tromp (left) and Andrew Kocher (right). Photo: The Book LLC. Devon, Pa. – June 2, 2018 – Since Tuesday, international horses and athletes have been competing for valuable points towards the week’s coveted Open Jumper championship. Following their top performances throughout the 2018 Devon Horse Show and Country Fair, Top Line Sport Horse International, LLC’s Kahlua, ridden by USA’s Andrew Kocher, and Beyaert Farm Inc.’s Eyecatcher, ridden by USA’s Mattias Tromp, were crowned the 2018 Open Jumper champions and winners of the Little Big Man Challenge Trophy. Both horses tied with 16 points at the conclusion of Saturday’s $70,000 Idle Dice Open Jumper Stake CSI4*, sponsored by Harvest Seasonal Grill and Wine Bar – Radnor, which was won by Kocher and Kahlua. The Amateur-Owner Hunter divisions crowned their respective champions on Saturday at the Devon Horse Show and Country Fair, where Lisa Arena Davis returned to Devon after six years to earn the Devon Grand Amateur-Owner 3’3″ Hunter championship title aboard Balou. The Dixon Oval hosted the English Pleasure Saddle Seat championship on Saturday evening, where 11 competitors put on their best show to vie for the tricolor ribbon. At the end of the evening’s class, it was Miller Young Fina who claimed the top prize with Maximum Velocity. Reserve champion was awarded to Elizabeth Ruffner and SSL Ringo. Scott Stewart and Private Life. Photo: The Book LLC. Devon, Pa. – May 30, 2018 – Few people have had as much success in the hunter ring as Scott Stewart, but being able to come to the prestigious Devon Horse Show and secure this year’s Devon Grand Hunter Championship and Devon Leading Hunter Rider award with Dr. Betsee Parker’s Private Life was as rewarding as ever for the renowned hunter rider and trainer. International show jumpers returned to the Dixon Oval on Wednesday to compete in the $35,000 Devon International Speed Stake CSI4*, sponsored by Herr’s. Pennsylvania native Andrew Kocher (USA) outpaced 28 horses and athletes with MKO Equestrian LLC’s Zantos II to ride away with the win and the George T. Pew Jr. Memorial Perpetual Trophy in the one-round speed competition. Ladies’ Day at the Devon Horse Show featured the long standing tradition of the Ladies’ Side Saddle championship. Horse-and-rider combinations competed in an undersaddle class, a hunter hack and an over fences class. At the end of an impressive show of skills from all competitors, it was Debra Taylor and Hypnotic (with trainer Susan Sisco riding over fences) who accumulated the most points to take home the championship ribbon. McLain Ward and Bellefleur PS Z. Photo © Sportfot. Wellington, FL – February 9, 2018 – Friday’s $35,000 Bainbridge 1.45m Classic CSI 5* marked the second major win in as many days for U.S. Olympic gold medalist McLain Ward, who captured the Friday victory at the Winter Equestrian Festival (WEF) aboard Bellefleur PS Z. The $35,000 Bainbridge 1.45m Classic had 54 entries contesting the speed track set by course designer Kelvin Bywater of Great Britain. Seventeen of those entries completed the course without fault, but none were faster than Ward, who was fresh off a win in Thursday’s $132,000 WEF Challenge Cup Round 5 aboard his 2017 FEI World Cup Final champion mount HH Azur. This time, Ward tripped the timers in 55.88 seconds riding Bellefleur PS Z, a nine-year-old Zangersheide mare owned by Ward’s godmother, Susan Heller, and Ward’s daughter, Lilly. In the $35,000 Equiline 1.45m Jumper Classic CSI 2*, Andrew Kocher (USA) was victorious riding Kahlua, owned by Top Line Sporthorse International LLC. They were fastest in an 18-horse jump-off from an original line-up of 83 entries with a time of 30.27 seconds. Alonso Valdez Prado (PER) and his own Chichester 3 finished second with a time of 30.59 seconds. Third place went to Felipe Amaral (BRA) and Germanico T, owned by Roberta Romalho, who had a time of 31.05 seconds. Baylee McKeever and her mount, Valor, owned by Lee McKeever, claimed the blue in Friday’s Washington International Horse Show (WIHS) Pony Equitation class. The pair set a high bar to beat in ring 11 as they finished with a high score of 84. McLain Ward and ZZ Top VH Schaarbroek Z clear the Puissance wall at the 2016 Rolex Central Park Horse Show. Photo Credit ©MegBanks/RCPHS. New York, NY – September 14, 2017 – The U.S. Open $50,000 Spy Coast Farm Puissance will return to Central Park for the second consecutive year, showcasing the courage and finessed communication between participating horse and rider combinations. Always a spectator favorite, the U.S. Open $50,000 Spy Coast Farm Puissance will begin after the conclusion of the U.S. Open $40,000 CSX FEI Speed on Thursday, September 21, and is set to start at 9:00 p.m. in Wollman Rink. The competition will begin with a traditionally decorated brick-wall obstacle set at 4 feet, 6 inches high. As combinations clear the jump, the wall is raised for reach round and the thrilling competition continues until only a single combination remains. Who will clear the towering wall as it grows taller and taller? Join us and find out! Last year’s competition saw a tie for McLain Ward riding Evergate Stables’ ZZ Top VH Schaarbroek Z and Andrew Kocher aboard Eagle Valley Partners’ C’Havinia. Seven entries started over the imposing Puissance wall and the competition continued up through four more rounds as Ward and Kocher jumped head-to-head at the final height of 6’9″. Neither rider was able to clear the wall at that height, leaving them tied for the win. Ward entered 2016’s competition at the last minute, though he’s no stranger to Puissance competitions. In fact, he has won many (including seven times at the Washington International Horse Show), and noted that the highest he has cleared is a staggering 7’3″. Kocher was a first-year competitor at the RCPHS last year, and he had only attempted the Puissance a few times prior. “That mare (C’Havinia) has never done anything like that,” he said. “I have done the Puissance three times at the Washington International Horse Show, and the first time was really bad, but this time I have been practicing for a few weeks. I didn’t have a big enough wall, so I put some hay bales in there to stack it up. It was fun,” he laughed. For more information on the Rolex Central Park Horse Show, please visit www.centralparkhorseshow.com. A portion of ticket sales will benefit a lengthy list of New York, as well as equestrian based, charities. Seating is limited and the demand for tickets is expected to be high. All seats have unobstructed views. All ticket sales are final, non-transferable; no refunds and no exchanges. Gates open 30 minutes prior to start of event. For Reserved Seating questions, please contact 1-844-319-CPHS (2747) or email tickets@img.com. For VIP Table Sales, please contact vip@centralparkhorseshow.com. Andrew Kocher and Navalo De Poheton. Photo Credit ©Sportfot. Mill Spring, NC – July 8, 2017 – Andrew Kocher (USA) piloted Navalo De Poheton to an impressive FEI win, topping the $130,000 Ariat® Grand Prix CSI 3* at Tryon International Equestrian Center (TIEC). The duo sped to a jump-off time of 38.89 seconds to finish ahead of Sharn Wordley (NZL) and Casper who collected second place with a jump-off time of 39.194 seconds. Richie Moloney (IRL) and Button Sitte rounded out the top three placings after stopping the timers in 40.379 seconds. Kocher and Navalo De Poheton bested a large class of 53 entries, as each horse and rider combination tried to capitalize on the difficult track set by Oscar Soberon (MEX). Only seven pairs advanced to the jump-off round, with three of the qualified riders incurring four jumping faults. The time was tight to beat in the first round, nearly adding five more combinations to the jump-off, but a single time fault kept them from taking their turn around the short course. “I think course building is hard. It’s hard to get it right, but I thought that Oscar [Soberon] did a great job tonight,” said Kocher. “He used a lot of old fashioned elements around the track. There was that hedge and some filling in the jumps that I think made some horses look or even get a bit more careful. “The smaller ‘S’ curve in the middle of the track caught people off guard and A to B of the triple combination started to back people off a bit, but he got seven in the jump-off, which was the number you were really looking for,” he added. Knowing that a strong contingent of fast riders was slated to enter the George H. Morris Arena behind him in the jump-off, Kocher was prepared to produce a fast round, but wanted to try and avoid making risky errors, which he admitted are typically is downfall. “The mistakes that I usually make are going way too fast and having rails down. I knew I didn’t want to do that. I wanted to go fast, but be comfortable and try to leave two out in the last line. I got lucky with Kristen [Vanderveen]. I think she could have left three out and would have beaten me by a mile,” he laughed. Navalo De Poheton, a 2001 Selle Francais gelding (Cumano x Double Espoir) owned by MKO Equestrian LLC, spent most of his upper level international career with U.S. rider Schuyler Riley before changing hands to Kocher and team earlier this season. Originally purchased as a potential sale horse for an amateur rider, Kocher quickly realized the gelding had not yet had enough of the grand prix atmosphere. Kocher has been extremely pleased with how the pair’s partnership has started since his purchase, as they took top honors in the Welcome Stake CSI 4* at Devon Horse Show earlier this spring and also placed well during the Upperville Horse Show CSI 4*. The gelding has seen some of the biggest tracks in the world, adding an additional and versatile threat to Kocher’s ever-growing string. Attesting to and recognizing the crowd size and enthusiasm of the night, Kocher commented on the engaging and electrifying atmosphere surrounding the George H. Morris Arena, which always gets him excited to compete under the lights. Kristen Vanderveen captured the FEI Leading Lady Jumper Rider Award presented by Meg Atkinson of Town & Country Realtors once again this circuit, based on her winning performance in the $35,000 Suncast® Commercial Welcome Stake CSI 3* on Thursday aboard Bull Run’s Faustino De Tili and her fifth place finish in this grand prix. Andrew Kocher’s groom, Chance Williams, was presented with the Absorbine® FEI Groom’s Award, which honors the groom of the winning grand prix combination, shining well-deserved light on their hard work and commitment to the care and well-being of the winning mount. Daniel Coyle and Farona. Photos © Sportfot. Wellington, FL – March 31, 2017 – The young horses of the 2017 Winter Equestrian Festival (WEF) got their opportunity to compete on the main stage on Friday, as the Five-Year-Old, Six-Year-Old and Seven-Year-Old Developing Jumper Classics were featured in the International Arena at the Palm Beach International Equestrian Center (PBIEC) in Wellington, FL. Daniel Coyle (IRL) and Farona won the $20,000 Spy Coast Farm Seven-Year-Old Developing Jumper Classic, Andrew Kocher (USA) and G Star were victorious in the $15,000 Spy Coast Farm Six-Year-Old Developing Jumper Classic. Coyle also rode Khaleesi to top honors in the $10,000 Gut Einhaus Five-Year-Old Developing Jumper Classic. Olaf Petersen, Jr. (GER) set the courses for the Developing Jumper Classics. In the $20,000 Spy Coast Farm Seven-Year-Old Developing Jumper Classic, Petersen saw 58 entries and 19 clear rounds to jump-off. Nine entries also jumped clear over the short course. It was Daniel Coyle’s time of 38.46 seconds that took the win riding Farona for Ariel and Susan Grange. Mario Deslauriers (USA) and Lisa Deslauriers’ Cooper Royal finished a very close second in 38.47 seconds. Ramiro Quintana (ARG) and Auer Sport Horses’ Ceitasi placed third in 38.98 seconds. “Farona is a star!” Coyle said of the winning Dutch Warmblood mare (by Baltic VDL) bred by NHG Broeders. “We bought her at the [WEF Sport Horse] VDL Auction here last year, and ever since the day we bought her, she has been amazing. She went to Spruce Meadows last summer and won I don’t even know how many classes. She won the six-year-olds at Angelstone, then came down here and did a few 1.40m classes. She won a couple of seven-year-old classes here this winter. She has done so much. The $15,000 Spy Coast Farm Six-Year-Old Developing Jumper Classic saw a win for Andrew Kocher (USA) riding his own G Star. Fifty-two entries contested the Six-Year-Old Classic, with 14 clear rounds, and four double clear over Petersen’s short course. Kocher and G Star clocked the winning time of 39.10 seconds. Tiffany Foster (CAN) and Artisan Farm’s Vienna placed second in 39.97 seconds. Lauren Tisbo (USA) guided Tequestrian Farms’ Graffiti Boy to third place in 41.51 seconds, and Gustavo Prato (ARG) jumped Nelson Pessoa’s Carioca ZE to fourth place in 43.13 seconds. G Star is a Dutch Warmblood mare (Carambole x Karshmire van Schuttershof) bred by I. Huijbregts. Kocher co-owns the mare with Willem Greve, who purchased her as a yearling and brought her along. Young Irish rider Jordan Coyle showed G Star early in the circuit before Kocher took over the ride just this week. With Kocher, she jumped clear in all three classes this week. Daniel Coyle also guided Ariel and Susan Grange’s Khaleesi to victory in the $10,000 Gut Einhaus Five-Year-Old Developing Jumper Classic earlier in the day. The Dutch Warmblood mare (Gaillard de la Pomme x Sir Corland) was bred by W.A.M. Tilbeke and purchased as a four-year-old by Brady Hayes. Eighteen entries showed in the class and five qualified for the jump-off. Coyle and Khaleesi jumped the faster of two double clear rounds. Their time of 41.78 seconds took top prize. Yannick Patron (FRA) rode Valhalla Equestrian Centre’s Inshalla V.A. to second place in 42.69 seconds. William Hickey (USA) and Pony Lane Farm’s Karlton placed third with four faults in the jump-off in 44.21 seconds. Khaleesi showed at the start of the circuit with Keri Sutherland before Grange made the purchase and Coyle took over the reins. Several special awards were also presented on Friday to recognize the riders and breeders of the circuit’s top young horses. Brendan Williams (riding Hercules) was presented the award for Best American Rider 25 and Under in the five-year-old division based on cumulative clear rounds in each section of WEF 1-12, excluding the classic. Theodore Boris (riding Flip de Hus Z) earned the award in the six-year-old division. Sarah Hubbard riding Farrero was the winner in the seven-year-olds. The under 25 rider awards were sponsored by DiAnn Langer. The Best Rider 26 & Over was also awarded in each division, sponsored by Spy Coast Farm and Lisa Lourie. In the five-year-old division, Yannick Patron earned the award riding Inshalla V.A. The six-year-old division awarded Vasco Flores, the rider of Manhattan. The best rider award in the seven-year-old category went to Armando Hassey, rider of Lomax. Special U.S. Breeders Awards were also presented in the Six and Seven-Year-Old divisions, sponsored by Spy Coast Farm, based on individual horse money won from WEF 1-12, excluding the classic. Gotham Enterprizes’ Manhattan earned the six-year-old award, home bred by owner Georgina Bloomberg, and sired by her winning mount Metropolitan (x Lancer III). The gelding showed throughout the winter with Puerto Rico’s Vasco Flores. The seven-year-old U.S. Breeder Award was presented to Spy Coast Farm and Lisa Lourie for Kimmel SCF, a Belgian Warmblood stallion ridden by Shane Sweetnam and sired by his famous former mount Amaretto d’Arco (x Lester). Also competing in the International Arena on Friday, the Hollow Creek Farm Under 25 Grand Prix Series hosted a 1.40m speed class, with a win for Rogelio Pellerano (DOM) riding Temporelle de Fritot. Jennifer Bliss, riding Sugarman, and Taylor St. Jacques, riding Di Samorano, impressed on the derby field at Palm Beach International Equestrian Center’s (PBIEC) Equestrian Village to win their respective sections of the $10,000 USHJA National Hunter Derby on Saturday. Ken Krome of Westminster, MD set the courses for the USHJA National Hunter Derby, which was awarded in two sections, a junior/amateur section and an open section. Competition consisted of a first round and handy trip where the top 12 riders from each section returned to determine the final placings. Bliss, of Wellington, FL, and Sugarman, owned by Harris Hill Farm, LLC, posted the top scores in both rounds of the open section with a 91 in the first round combining with a 93 in the second round for a total of 184. Maria Rasmussen of Oak Creek, WI finished in second riding Subject to Change, owned by Corporate Way, LLC, after scores of 86 and 92 for a combined total of 178. Rachel Kennedy of Brookeville, MD rounded out the top three ribbons riding Dubai for owner Casey Millis after scores of 88.5 and 88 combined for a total of 176.5. Sugarman, a ten-year-old gelding, joined Bliss’s string four years ago before embarking on successful Pre-Green and First Year campaigns. In 2015, the pair competed in their first-ever international derby competition together at WEF. The USHJA National Hunter Derby during WEF 12 marks Sugarman’s third horse show back in the competition ring, as well as the horse’s fourth derby class ever. In the junior/amateur ranks, 17-year-old St. Jacques of Glen Allen, VA piloted her own Di Samorano to the first-place ribbon on scores of 88 and 83 for a combined total of 171. Samantha Schaefer of Westminster, MD earned the second-place ribbon riding her own Stallone on scores of 85 and 83.5 for a combined score of 168.5. Rounding out the top three, Hannah Doherty of Westwood, MA piloted her own Vondel DH Z to the yellow ribbon with scores of 83 and 84 combining for a 167 total. Di Samorano, an eight-year-old Dutch Warmblood gelding by Samorano, also serves as a top equitation mount for St. Jacques and was previously owned by Heritage Farm, where St. Jacques trains with Patricia Griffith and Andre Dignelli. “I have really been focusing on the equitation with Di Samorano this season, so I thought it would be fun to do a little derby with him during the last week,” concluded St. Jacques. Competition continues on Saturday at PBIEC featuring the $216,000 The Wanderer’s Club Grand Prix CSI 4* during Saturday Night Lights, round one of the $50,000 USHJA International Hunter Derby on the Derby Field at the Equestrian Village (AGDF show grounds), and champion presentations in the Junior Hunter divisions. For full results, please visit www.PBIEC.com. Andrew Kocher and Uppie de Lis. Photo by Shawn McMillen Photography. October 26, 2016 – Washington, D.C. – The 2016 Washington International Horse Show (WIHS) hosted its first day of jumper competition at Verizon Center in Washington, D.C. on Wednesday with a win for Andrew Kocher (USA) aboard Uppie des Lis in the feature $10,000 International Jumper speed class. The $10,000 WIHS Children’s and Adult Jumper Championships were also highlighted with a win for Sarah Boston and Herminas in the $10,000 WIHS Children’s Jumper Championship, presented by The Klein Family & Lance Williamson Stables, and victory for Dean Dignelli riding Redefin in the $10,000 WIHS Adult Amateur Jumper Championship, presented by The Treacy Family. Ireland’s Alan Wade is the course designer for jumper competition at WIHS this week. He opened the week with 45 starters in the $10,000 international speed class and 21 clear rounds. Kocher and Uppie des Lis, a 15-year-old NRPS gelding (Andiamo x Landsieger) owned by BTS Entertainment and Sales, clocked the winning round in 50.20 seconds. Shane Sweetnam (IRL) and Main Road, owned by Sweet Oak Farm and Seabrook LLC, finished second in 50.26 seconds. Catherine Tyree (USA) and Mary and Joseph Tyree’s Enjoy Louis finished third in 51.30 seconds. Wednesday’s class marked Kocher’s first win at WIHS. He has shown at the competition in the junior jumpers and hunters, as well as jumping in the Puissance class twice, but explained that he never did the bigger open classes. This week he came to WIHS to jump Saturday’s $130,000 Longines FEI World Cup™ Jumping Washington, presented by Events DC, as he hopes to qualify for the Longines FEI World Cup Finals in March with Uppie de Lis. “He is my most consistent horse, and I came to do the World Cup class, so I’m excited,” Kocher detailed. “I have been resting him for three or four weeks now just to have him fresh for this, and then we’ll go to Kentucky. He jumped really nice in Omaha in the spring, which is a ring like this. He is actually good in every ring. He is a very solid horse. In addition to Uppie de Lis, Kocher has a young mare named Ciana that will jump in the speed class on Saturday, as well as a mare named C’Havinia that will jump Friday night’s Puissance. 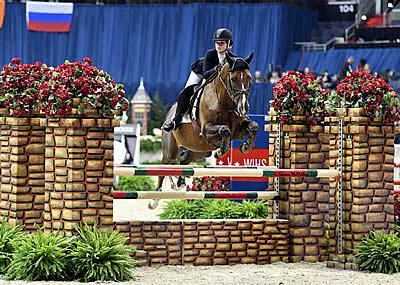 She recently tied for first place in the $50,000 Puissance at the Central Park Horse Show, so Kocher hopes that the experience will help their attempt at the wall this week. Uppie de Lis will jump again Thursday and then rest for Saturday night’s big event. Jumper competition got underway early Wednesday evening with a win for 16-year-old Sarah Boston of Owings Mills, MD riding Herminas in the $10,000 WIHS Children’s Jumper Championship, presented by The Klein Family & Lance Williamson Stables. The competition saw 31 entries, with 17 advancing to the jump-off and four double clear rounds. With the fastest second round in 30.51 seconds, Boston and the 13-year-old Trakehner gelding (by Viskis) earned the H. Fenwick Kollock Memorial Perpetual Trophy, donated by Friends of Fen. Emma Seving and Easy Money finished second with a time of 31.54 seconds. Ava Ellis and Diederique van der Knapp’s Clive placed third in 31.55 seconds, and Caroline Ellis guided Starlight Farms’ Catalyst to fourth place honors in 34.98 seconds. Boston leased Herminas from trainer Don Stewart in February this year and has had a great season with the gelding leading up to her qualification to compete at WIHS. “It is really awesome just to know that all of the hard work paid off finally,” Boston said of her win. “My horse was really good. He’s perfect. He is just willing to do anything. Boston has shown at WIHS before in the ponies, but this was her first time in a few years and a different experience doing the jumpers on a horse. Boston heads back to school in Baltimore Thursday. Along with training with Stewart in the winter and summer, she also rides on the varsity equestrian team at McDonogh School training with Streett and Amy Moore. She plans to move up to the Low Junior Jumpers this winter. The $10,000 WIHS Adult Amateur Jumper Championship, presented by The Treacy Family, was held in the evening session with a win for Dean Dignelli of Katonah, NY riding Heritage Farm Inc.’s Redefin. Thirty-nine entries started over the first round course, with a five-horse jump-off and two double clear rounds. Dignelli and Redefin, an 18-year-old Dutch Warmblood gelding (by Larino), were the winners in 25.85 seconds. Elizabeth Porath and Redfield Farm’s Tequila Girl placed second in 27.76 seconds. Whitney Lind and Whish LLC’s Wanant placed third with four faults in 27.96 seconds. Dignelli began riding three and a half years ago and showed at WIHS for the first time in 2015, finishing a close second in the same class with Redefin. This year, he was determined to get his win. He earned the top prize and will have his name added to the Dorothy Foote “Goodie” Taylor Memorial Perpetual Trophy, donated by Mr. & Mrs. Robert Ashton Hill and Miss Linden Joan Hill. Dignelli (27) is part of a well-known equestrian family, but only recently started riding and joined the family business at Heritage Farm. His uncle, Andre, is one of the top trainers in the country and his father, Michael, is a business partner and important part of the Heritage team. Dignelli chose to pursue his interest in baseball at a younger age, but he eventually came around to equestrian sport and now has his sights set on a grand prix career. Dignelli has moved up quickly from his first lesson on a lunge line with good friend Matt Metell, to showing at some of the nation’s top competitions in the Adult Jumpers. He has won at the Winter Equestrian Festival, Spruce Meadows, and the Hampton Classic Horse Show, among others. Last week he also won at the Pennsylvania National Horse Show in Harrisburg. Though some people might have trouble training with family members, Dignelli appreciates his uncle’s great knowledge and tries to learn as much as he can from the world-class equestrian. Along with his riding, Dignelli works for the farm doing logistics and transportation. He started a shipping company called Iron Horse Transport and has a golf cart company for sales and rentals called Dean’s Iron Horses. After his win on Wednesday night, he immediately left to drive a truck of horses back to New York. Dignelli is getting to know a new horse and will keep working to move up the ranks. Jumper competition at the 2016 Washington International Horse Show continues on Thursday with Low and High Junior/Amateur-Owner classes featured in the afternoon, along with a $35,000 International Jumper Welcome Stake. The evening session will welcome local horse lovers, riders, trainers, and their families for Barn Night, presented by Dover Saddlery with the generous support of The Peterson Family Foundation and National Harbor, beginning at 6 p.m. The $35,000 International Jumper Accumulator costume class will be the highlight competition of the evening. For full results, visit www.wihs.org. McLain Ward and HH Carlos Z. Photos copyright Sportfot. September 22, 2016 – New York, NY – Day two of the 2016 Rolex Central Park Horse Show (RCPHS) featured international show jumping set to the backdrop of the New York City skyline on Thursday, September 22, in Central Park’s Wollman Rink. Thursday was deemed “Canadian Pacific Day”, as competition highlighted the $40,000 U.S. Open Canadian Pacific FEI Speed Class, which saw a win for McLain Ward (USA) aboard HH Carlos Z. The evening’s competition also featured the $50,000 Engel & Völkers Puissance, where Ward and Andrew Kocher (USA) tied for victory by clearing the impressive wall in four rounds, and jumping off at 6’9″ inches. The $25,000 U.S. Open Hollow Creek Farm Under 25 FEI Grand Prix was held on Thursday as well, with a win for Daniel Coyle (IRL) aboard Fortis Fortuna. The course designer for international show jumping competition in Central Park is this year’s Rio Olympic Games designer Guilherme Jorge (BRA). In the $40,000 Canadian Pacific Speed class, which was held in a faults converted format, Jorge saw 34 horse and rider combinations that included some of the world’s very best. Two-time Olympic Team Gold Medalist and Rio Olympic Team Silver Medalist McLain Ward was the winner in a blazing fast time of 58.63 seconds aboard the 14-year-old Zangersheide gelding HH Carlos Z (Chellano Z x Voltaire). Ward and ‘Carlos’ have won in some of the greatest destinations and biggest competitions in the world and led the victory gallop for the first time this year in the world-famous Central Park event. Conor Swail (IRL) won the class in the first two years of RCPHS competition, but settled for second place this year, with a time of 60.26 seconds riding Ariel and Susan Grange’s Cita. Hardin Towell (USA) and Evergate Stables’ Lucifer V finished third in 60.45 seconds. Emanuel Andrade (VEN) and his own Hardrock Z placed fourth in 64.77 seconds. Commenting on two victories in one night, Ward noted, “For me, it is a good comeback, because my record here is not so good. I think my best score is 16 and I think I have fallen off twice, so I was actually having a little nervous laugh about that on the way down to the ring tonight. Remarking on his second place finish, Swail detailed, “I think right from the start Hardin put up a very good time. It seemed that it was going to hold quite well throughout the class, but there are a lot of world-class competitors here this year. McLain went in, and he is a very fast rider and he has a very fast horse, so I think everything came off very well for him. Swail started riding Cita this time last year and was happy with the mare’s performance Thursday night. Though his time did not hold up for the win, Hardin Towell had a great experience with his mount Lucifer V and feels confident in his horse heading into Friday’s grand prix competition. The evening’s competition concluded with the $50,000 Engel & Völkers Puissance, which saw a tie for McLain Ward riding Evergate Stables’ ZZ Top VH Schaarbroek Z and Andrew Kocher aboard Eagle Valley Partners’ C’Havinia. Seven entries started over the imposing Puissance wall set at a height of 5’3″, and the competition continued up through four more rounds as Ward and Kocher jumped head-to-head at the final height of 6’9″. Neither rider was able to clear the wall at that height, leaving them tied for the win. Ward rode ZZ Top VH Schaarbroek Z in the Puissance competition after the gelding also competed in the Under 25 class with young rider Oliver McCarthy. It was a last minute decision to enter the class, but Ward already knew the horse well and got a little encouragement from longtime manager Lee McKeever. Ward is no stranger to Puissance competitions. In fact, he has won many (including seven times at the Washington International Horse Show), and noted that the highest he has cleared is a staggering 7’3″. For Andrew Kocher, this was his first time competing at the RCPHS and one of few times he has attempted the Puissance. International Equestrian Group and RCPHS founder Mark Bellissimo enjoyed all of Thursday evening’s competition and spoke after the event, thanking riders and sponsors. The $25,000 U.S. Open Hollow Creek Farm Under 25 FEI Grand Prix was the first competition held on Thursday evening with a win for Daniel Coyle of Ireland riding the 11-year-old Belgian Warmblood mare Fortis Fortuna (Quidam de Revel x Carthago). Course designer Guilherme Jorge saw 14 competitors in round one, with three advancing to the tie-breaking jump-off. Bryn Sadler (USA) and Showcase 81 LLC’s Bon Giorno were first to return over the shortened course, with one rail down in a time of 40.28 seconds to finish third. Coyle followed aboard Susan and Ariel Grange’s Fortis Fortuna, also dropping one rail, but in a faster time of 35.57 seconds for the win. Alexandra Crown (USA) and her own Von Cim were last to go, but were also unable to complete the course without fault, clocking in at 37.35 seconds to finish in second place. Competition in Central Park’s Wollman Rink continues through Sunday, September 25, with more multi-discipline equestrian sport for jumpers, dressage, and hunters. Friday features the U.S. Open Dressage Grand Prix CDI 4*, presented by Axel Johnson, at 1:30 p.m. The evening session includes the $5,000 Junior/Amateur 1.20m Jumper class and the $216,000 FEI Grand Prix CSI 3*, presented by Rolex. For more information, visit www.centralparkhorseshow.com. Ocala, FL (February 13, 2016): Elite show jumping competition commenced in Week IV of the Ocala Winter Circuit with the $2,500 Brook Ledge Welcome Stake and the $25,000 SmartPak Grand Prix. Andrew Kocher from Lake St. Louis, Missouri and Ciana, owned by Eagle Valley Partners LLC, slipped past Aaron Vale riding from Williston, Florida and Carlo, owned by Amatoville Enterprises, and Lisa Goldman of Hawthorn Woods, Illinois on Barbara Disko’s Sovereign to win the $2,500 Brook Ledge Welcome on Wednesday at HITS Post Time Farm in Ocala, Florida. In what is turning out to be a battle of the speedsters, these three riders have been duking it out for the top spot in the Open Jumper classes each week of the Ocala Winter Circuit – Kocher, Vale and Goldman were all in the top three last week’s $50,000 HITS Grand Prix. Wednesday’s class featured a 1.40 meter course designed by Olaf Petersen Jr. of Muenster, Germany. Thirty-eight riders tackled the 13-effort course with 22 jumping clean to advance to the jump-off. Marilyn Little of Frederick, Maryland riding Venus, owned by Raylyn Farms, held the early lead with a clear jump-off round in 47.019. When Vale stepped in to the ring on Carlo, you could tell he had a plan to take the lead. “These German course designers, both Petersen this week and [Martin] Otto last week, are really making galloping tracks and I saw that it would take someone to put the gas pedal down to win. I caught a really good turn back to the in and out and caught the last fence on an open stride.” Vale stopped the clock at 44.351 to take over the lead. No one underestimated the fact that Kocher was still to go on. With nothing to lose, he and the 9-year-old Dutch Warmblood Ciana laid it all on the line and despite a bit of a buck when landing off one fence, their time was a commanding 43.495, almost a full second faster than Vale. 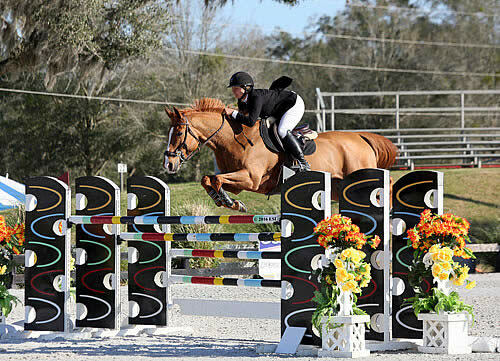 Lisa Goldman, of Hawthorn Woods, Illinois, and her veteran partner, Morocco, swept the competition in Thursday’s $25,000 SmartPak Grand Prix at HITS Ocala for the second week in a row. Devin Ryan, of Long Valley, New Jersey, riding his own Liratus, was second and Mathew Williams, of Wellington, Florida, riding Valinski S, owned by Michael Dorman and Wyndmont, Inc., was third. Andrew Kocher, of Lake St. Louis, Missouri, on Uppie De Lis, owned by BTS Entertainment and Sales, was the fastest with four faults for fourth and the top five rounded out with Hunter Holloway, of Topeka, Kansas, riding VDL Bravo S, owned by Hays Investment Corp.
Spectators are flocking to the Ocala Horse Properties Stadium during the Grand Prix days to watch the excitement unfold as all the top riders jump for the glory. 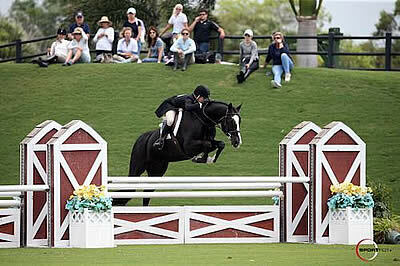 One horse and rider have consistently thrilled the crowd as they speed around the course – Lisa Goldman and Morocco. They topped the class of 38 competitors with a double clear trip in 42.717 seconds. Olaf Petersen Jr., of Germany, designed the 1.50-meter course of 14 obstacles on a 530 meter track. Seven of 38 jumped first round clears, but only three jumped double clear. First to contest the jump-off was Kocher on Uppie de Lys. The opening fence was a triple bar, followed by eight tight strides to a vertical at 9B, which toppled for four faults. Kocher kept up the pace with a really tight turn on the rollback to the second to the last, and a gallop home to the Platinum Performance oxer to stop the clock at 42.190, ultimately earning him fourth-place. Next up was Williams and Valinski S, who opted for a careful clean in 47.146 to take over the lead. Ryan was up next on the big bay Liratus. The 11-year-old Danish Warmblood jumped in classic form, clocking in at 45.261 when Ryan sliced the second to the last, riding a really direct line to the final oxer to set a new Great American Time to Beat. Taizo Sugitana and Chin Quidam VDL, owned by Hyperion Stud, LLC, were eliminated at 7A of the combination to take seventh place. David Beisel riding the big grey Call Me Hannes, owned by Harlow Investment Enterprises, LLC, had four faults at 7A to finish sixth in 45.846. Next to go was Goldman and Morocco, and they did not disappoint as they galloped the course. They added a stride up in the opening line to accommodate Morocco’s stride which caused a few gasps as he swerved in front of the last jump, but still managed to jump clear in a time of 42.717 to take over the lead. The final contestant was Holloway and VDL Bravo S, who also fell victim to 7A for four faults in 45.417 to finish fourth. For more information and a complete schedule of classes and events, visit HitsShows.com. Stay connected with HITS: join us on Facebook or follow us on Twitter and Instagram. Andrew Kocher and Rooney IV. Ocala, FL (February 5, 2016): Jumpers descended on HITS Post Time Farm to compete for a shot at the blue and a piece of the prize purse in the Week III $25,000 SmartPak Grand Prix and the $2,500 Brook Ledge Open Welcome. Lisa Goldman of Hawthorn Woods, Illinois and her longtime partner Morocco sped to another victory in the $25,000 SmartPak Grand Prix on Thursday. Aaron Vale riding from Williston, Florida and Thinkslikeahorse’s Spirit of Alena was second, and Andrew Kocher from Lake St. Louis, Missouri and Uppie de Lys, owned by BTS Entertainment and Sales, finished in third. Riders took their turn at the 1.50-meter course set by German course designer Martin Otto. Nine riders jumped clear in the first round, which included three double combinations. In the jump-off, riders rode with a no holds barred attitude, and tried their best to take home the winner’s share of the prize money. The jump-off started with a triple bar followed by a long gallop to a vertical. It also included a combination across the center of the ring followed by a sharp turn to a bending line, finishing with an oxer just past the In-gate. First to go in the jump-off was Hunter Holloway of Topeka, Kansas on VDL Bravo S, owned by Hayes Investment Corporation. The grey cleared the fences easily to earn a clear round in 47.015 seconds. Lisa Goldman riding Mary Goldman’s Centurion B was up next, but a rail at the third fence cost her four faults. Her fast time of 45.307 held up for sixth place. Vale pulled out all the stops on Spirit of Alenaand galloped home to take the lead in 44.269 seconds. Kocher and Uppie de Lys followed in 45.201, which was a full second off the pace to step into second. Manuel Torres and Christopholini H got into a little trouble and retired taking the eighth-place prize. Brandie Holloway and Lucky Strike, owned by Hays Investment Corporation, delivered a fast clear in 46.184 seconds to take fourth. Stepping into the ring next, Goldman threw all caution to the winds and trusted her 13 year old partner to do his job. She galloped, turned and angled to the fences, finishing almost a full two seconds faster than Vale in a time of 42.793 to set an unbeatable Great American Time to Beat. Kocher and Ora del te LLC’s Ora Del Te Di La San Giorgio followed with a rail and a time fault for seventh place and Denise Wilson and Blue Gate Farm LLC’s Catuso chose not to return for the jump off and placed ninth. Andrew Kocher from Lake St. Louis, Missouri took charge in the $2,500 Brook Ledge Welcome Stake on Wednesday at HITS Post Time Farm in Ocala, Florida. He not only won the class on his Rooney IV, but was also third place with Prof de la Roque, owned by Postagestamp Farm, LLC, and fifth place with his own Le Conte. Aaron Vale of Williston, Florida took second-place honors with Carlo, owned by Amatoville Enterprises. Fourth place was Diamantes Legacy with owner and rider Derek Petersen of Archer, Florida. Martin Otto of Germany designed the 1.40-meter course. Riders galloped the length of the stadium from fence one to fence two in both the first round and the jump-off with an optional, time-saving inside turn by the gazebo to a combination. The jump-off finished with another very long gallop to the final oxer. Thirteen of thirty-one entries completed the first round without faults and moved on to an immediate jump-off where seven went clear. First to move on to the jump-off was Petersen on Diamantes Legacy. They galloped to the second fence, and to the last, and took the inside turn by the gazebo for in a speedy 41.876 seconds. Rooney IV and Kocher were the next to try the jump-off track. Kocher chose to gallop around the gazebo for a longer route but never took back, taking over the lead with a time of 39.933 seconds. A few trips later, Kocher returned to the ring and was double-clear again, this time on Prof de la Roque. He went around the gazebo again but cut inside the in and out to the last fence. He couldn’t best his own time, putting him in second with a time of 41.097 seconds. Vale and Carlo chose the inside the gazebo route and kept up the pace to knock Kocher out of second place, clocking in at 40.918. Kocher’s final attempt at the win was on Le Conte and he placed fifth with a time of 42.456 seconds.